Indie ski makers continue to subvert ski culture from within, playing by their own rules, bringing new ideas to the slopes. All revolutions start small, but the mainstream regime has been put on notice, and more American skiers are declaring independence. There’s a ski factory in Bangor, Maine. It’s not a big one. Chris Bagley, a recent graduate of UMaine Orono and longtime Sunday River and Sugarloaf skier, hopes to press 50 pairs of skis this year under his nascent Volition brand. “Sometimes I’ll grab beers and have some buddies over to help out,” Bagley says. And his fiancée’s studies in structural engineering come in handy. But otherwise Volition is a company of one. And Bagley isn’t even full-time. During the day, he puts his new-media degree to work as a web developer. Bagley doesn’t sound like a bitter guy with a stick-it-to-the-man agenda. He wasn’t dissatisfied with the big-brand skis on the market. He’s just an avid skier and a committed consumer of local products. After a day of work developing websites, he likes to get his hands on something more tangible. The cliché is unavoidable: Making skis is his labor of love. Knowing exactly how many indie brands exist in North America, much less how big a share of the market they control, is impossible. The industry trade group SIA carefully tracks sales of skis sold in shops, but many indie brands sell directly to consumers, and those sales go uncounted. “The best you can do for now is try to estimate their market share,” says SIA’s CFO, Bob Orbacz. “If there are eight or 10 of them doing four or five thousand pairs, plus a bunch of smaller ones, you might be looking at something like five to 10 percent of the market.” Orbacz’s estimate sounds about right to other industry veterans. Bagley’s Volition is unusual in that it’s based in the East. The majority of indies were bred in the Rockies. And the small-batch phenomenon isn’t entirely new: Brands like Miller, Igneous, Goode, RD, S Ski, Scotty Bob, and others—many long defunct—date back to the ’80s and ’90s. With help and inspiration from the online community at Skibuilders.com, Bagley started out with a press he built from plywood. This year he upgraded to one made of metal. He’s had his struggles along the way. Getting materials delivered promptly from suppliers who have much bigger accounts can be tough, for instance. Other indies have learned even harder lessons in ski retailing. 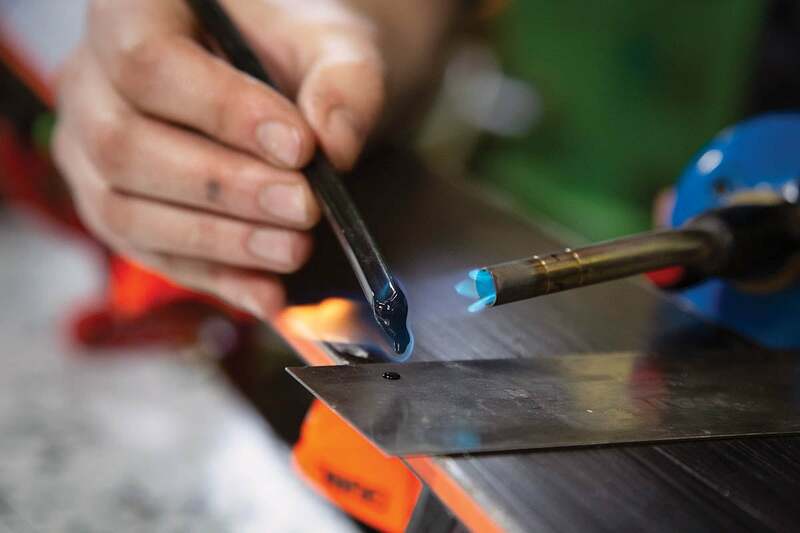 Moment Skis founder Casey Hakkanson, for instance, says last year’s snowless season crimped his cash flow, forcing him to cut back the number of skis he’ll build this year. Retailers struggling to pay for skis that didn’t sell sometimes choose to settle up with the big guys first, knowing those brands are more important to their success. But walk into just about any ski shop these days and it’s likely to have a couple of token indie brands on the wall. Cruise the message boards and you’ll see plenty of unreserved enthusiasm for U.S.-based manufacturers. Salt Lake City’s DPS, for instance, says it can’t keep up with demand. There’s a waiting list for its Spoon model, a radical powder ski design featuring a convex base. Indie fans have differing reasons for spurning mainstream brands. One message board poster admits there’s just a “cool factor” to having something no one else on the hill has. Some are ardent supporters of U.S.-based manufacturing (though many indies outsource manufacturing to Asia, just as some of the big guys do). As for the quality of the indie-brand ride, it’s uneven—even within the lines of some brands, and even from pair to pair of a given model. Bob Gleason, the Telluride shop owner and longtime SKI Magazine tester—likes two brands well enough to carry them in his shop: Wagner and Armada. He’s especially impressed with Wagner, based in nearby Placerville (though its custom creations start around $1,800). Gleason, like other testers, says some brands he’s tried still have a ways to go. What ultimately matters, though, is what sells, and for many skiers, “Made in USA” is enough. Bagley says now that he’s developed contacts, he gets all the components he needs from U.S. suppliers. Graphics are the easy part—he admits he’s more artist than engineer, and his Volitions are beautiful. Ski making probably won’t pay the bills this year or even the next, and Bangor will remain a quiet outpost of the manufacturing world. For now, he gets more out of it than he puts into it, and that’s profit enough. For lots of indie ski buyers, supporting domestic jobs is a big part of the buzz. Check out a gallery of notable American brands that manufacture on U.S. soil. Ski Mag is ready to head for Snowbird for our annual five-day ski test. Here’s what manufacturers have entered. May the best skis win. Ever considered Alpine Touring? The latest trend is taking skiers and gear companies by storm.